Happy Friday, loves! Most of you know how obsessed I am with anything blush pink, so I knew the minute I saw this jumpsuit that I had to have it. It's so comfortable and definitely a piece that can easily be dressed up or down. Pairing it with my blush pink rockstuds was a must and I went with a bold, statement eye to really bring out the cool tones and make the outfit pop. I'm so excited for a little R&R this weekend with family + friends. I hope you guys have a great couple of days off and cheers to sunshine, saturday brunch + laughing 'til it hurts! This jumpsuit fits you like a glove and you look absolutely stunning - gorgeous outfit!! Your best look yet! Absolutely LOVE it! That jumpsuit looks gorgeous on you and I love the blush color! Gorgeous photos! 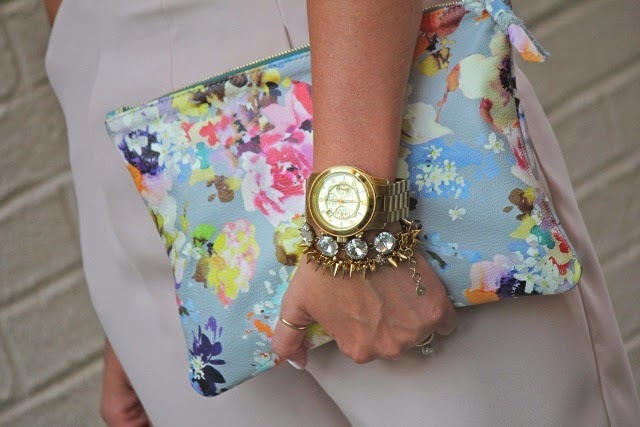 Love that floral clutch too! So pretty! I love the blush color but have a hard time pulling it off with auburn hair. You look great and the rockstuds are the perfect finishing touch to that adorable jumpsuit! I love blush pink too! This is a super cute jumpsuit. I love your style! Keep up the good work! That jumpsuit looks gorgeous on you! That jumpsuit is absolutely amazing! That jumpsuit looks gorgeous on you and I love the blush color! If you don't mind me asking what size are you wearing? That pantsuit fits you perfectly! This romper was made for you!! Fantastic fit and looks fabulous on you! Gorgeous.